Volume 24 of the Gabriel Wells Definitive Edition of Mark Twain's Works is The $30,000 Bequest and Stories. The contents of this volume are identical to the contents of the book issued by Harper and Brothers under the same title in previous uniform editions after mid-1917. (For the history of the shifting contents of this volume, see Chapter 26.) The Introduction for this volume was written by Albert Bigelow Paine. THE contents of this volume of Mark Twain's collected writings must, as a whole, have been satisfactory to their author. Mark Twain's idea in any collection was to maintain a consistent, a lack of orderly relation. The mind should be entertained, he declared, very much as it would conduct itself if left alone; that is to say, in an eccentric fashion, flitting to this thing and that, apparently without rhyme or reason. Once in his publishing days Clemens engaged William Dean Howells to prepare a "Library of Humor," and when Howells had selected the matter and arranged it in proper sequence and relation Clemens went through it, pulled it all to pieces, and made a jumble of it, saying that, as the volume was intended primarily for entertainment, its natural order would be a complete disorder, affording, as he believed, an added enjoyment to the reader. When in 1906 the demand for another Mark Twain volume became pressing, this natural order of selection would seem to have been a necessity. There was plenty of good material -- some of the very best, indeed -- but it was of widely varying character and period. Some of it dated a good ways back. "Edward Mills and George Benton," for instance, was contributed to the Atlantic Monthly in 1880. The introduction to the New Guide of the Conversation in Portuguese and English was written about two years later, when James R. Osgood wished to issue a new American edition of that quaintly absurd little textbook. Perhaps the most important feature of this volume is the third in order, "Was it Heaven? or Hell?" and this story has its history, too. The Clemens family spent the summer of 1902 at York Harbor, Maine, in a place called "The Pines." Howells was a short distance away, at Kittery Point, and a frequent visitor. One afternoon, sitting on the veranda of The Pines, he told Mark Twain a pathetic episode in the lines of some former occupants of that house -- the tale of a double illness, where a righteous deception was carried on for several weeks for the benefit of a life that was about to slip away. Clemens was deeply impressed, and presently began building a story on this foundation. Mrs. Clemens's health failed that summer, and for a time it was feared that she would not be able to be moved to their winter home, then at Riverdale, New York. The journey was made, but for many months her condition was critical. When the story "Was it Heaven? or Hell?" appeared in Harper's Magazine (Christmas, 1902) almost the exact conditions prevailed in the Clemens's household that Mark Twain had pictured in his story. There was still another coincidence, for a letter came from a man who had recently faced a similar situation in his own family, and his daughter (who had died) had even borne the same name -- Helen. But the story attracted attention for other reasons. Next to "Hadleyburg" it is probably Mark Twain's greatest fictional sermon. It presents in another form the folly of self-righteousness, and in its heartbreaking sorrow searches out the very depths of the human soul. A flood of grateful letters came to its author. An Englishman wrote, "I want to thank you for writing so pathetic and so perfectly true a story." Another said, "I learned to love those maiden liars -- love and weep over them -- then put them beside Dante's Beatrice, in Paradise." "Marriages are what the parties to them alone really know them to be, but from the outside I should say that this marriage was one of the most perfect." So it was natural enough, when Mark Twain turned to writing again, that he should visualize their lost happiness as Eden, and should produce that beautiful idyllic fancy, Eve's Diary, which in the widest and most reverential sense, from the first word to the last, conveys his love, his worship, and his tenderness for the one he had laid away. There is tenderness, there is sweetness and affection in its every line, even more in its humor than elsewhere. But it is Adam's single comment at the end, "Wherever she was, there was Eden," that holds the full tale of Mark Twain's love and sorrow, and is perhaps the most beautiful line he ever wrote. "The $30,000 Bequest" was originally published as a short story in Harper's Weekly, December 10, 1904 with illustrations by Peter Newell. The Gabriel Wells Definitive Edition is the first to feature one of Newell's original illustrations from the 1904 magazine printing. Also featured in Volume 24 is one illustration by Frederick Strothmann (b. 1872 - d. 1958). Strothmann, born in New York, was the son of German immigrants. Although a number of reference books cite his year of birth as 1879, three of his passport records available at ancestry.com establish the date of his birth as September 23, 1872. Strothmann studied in Paris and at the Berlin Royal Academy. After returning from abroad, he achieved success as a noted magazine illustrator and political cartoonist. Strothmann illustrated Mark Twain's 1903 edition of The Jumping Frog and the 1904 edition of Mark Twain's Extracts from Adam's Diary -- both for Harper and Brothers. 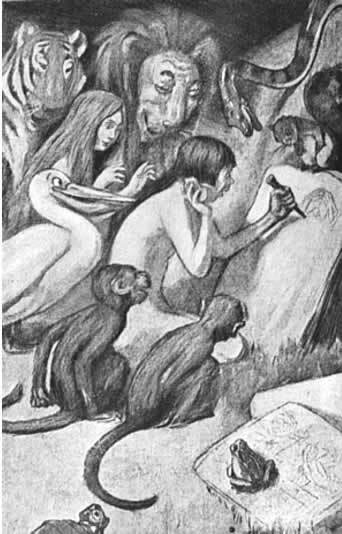 Strothmann's illustration of Adam writing in his diary is featured in Volume 24 of the Gabriel Wells Definitive Edition and is the first time Strothmann's work was used in a uniform edition of Mark Twain's works. For the background and history of the other illustrations that are featured in Volume 24 The $30,000 Bequest, both those listed in the official illustration list and those that are not, see Chapter 26. "Celebrate Twain's Seventieth Birthday," The New York Times, 6 December 1905. "F. Strothmann," The New York Times, 14 May 1958, p. 33. 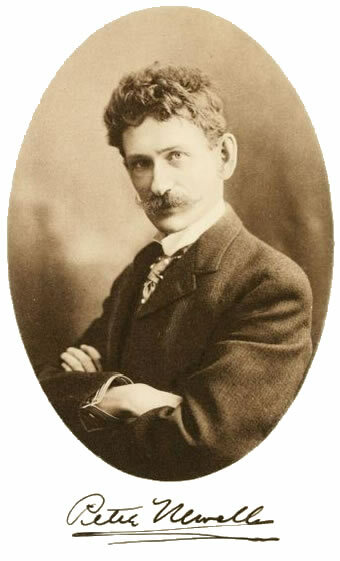 Frederick Strothmann. U. S. Census and passport records from ancestry.com.